An OMR (Optimal Mark Recognition) sheet is a Computer readable sheet and compiles the information automatically on scan. 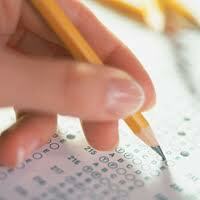 During the examination you will be provided with a Question paper and an answer OMR sheet. First fill the useful information on the OMR sheet like your Registration no, Question paper code, Question paper set etc. Please note that if this information is not provided or contains error, the computer will not be able to recognize your answer sheet. OMR sheet should be fill up with HB Pencil or If instructed with ball pen. OMR sheet contains Oval Circle in which aspirant has to fill it. Its better you take Apsara Dark pencil by which you can fill the circle with less time. Before the exam day try to practise filling the cells which are given in booklet or bulletin. Try to Limit erasing the marked answers. Avoid Marking the answers in Booklet then filling up the OMR sheet at last 30 Min. This will lead to confusion and also you may mark wrong options unexpectedly. Sharp the pencil but use always a blunt tipped pencilto mark the answer that will save your time. Be confident during filling the answers. Donot Let the marking cross the outer line of the circle. If you have any Queries ask us.